I learned that last summer when I lived in Pisa. Most days after working in the marine biology lab, I would stop by a little panificio on my way home to buy a bit of focaccia for a snack. I would ask how much a euro would get me, and they would slice a strip off of a large round and hand it to me in a little paper bag. My favorite kind was the walnut-studded focaccia. 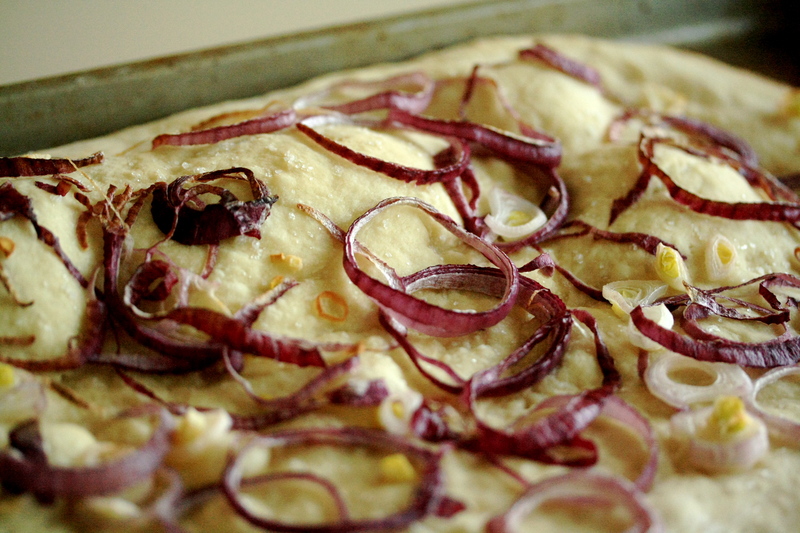 It was rich and hearty, and the soft dough was punctuated by the crunch of the walnuts. I think there must have been something else in the dough that made it different from the plain kind because it was a darker color. I always had to wash my hands with soap after eating it because they’d get so oily. 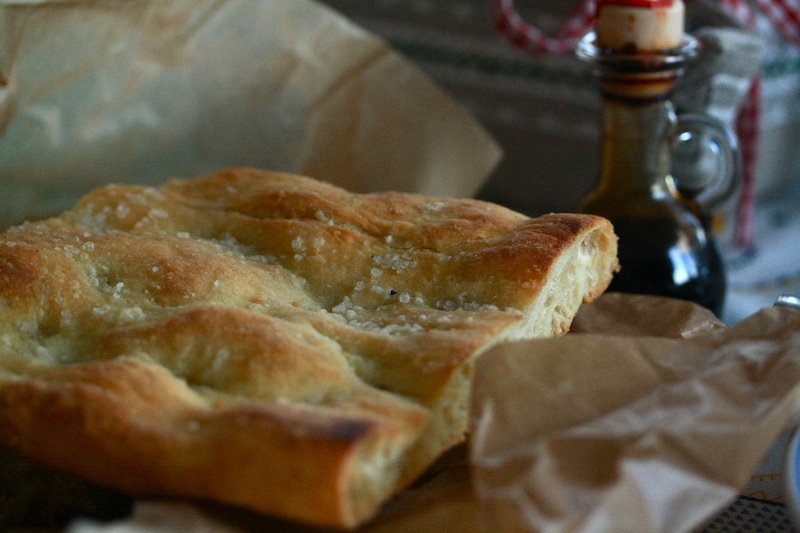 While this focaccia that I’m sharing with you today is not that walnut one, it is delicious in its own right. This is the one that we often make at home when we have guests coming. It’s really easy to pull together, provided you plan ahead to allow for rising time. I love how the onions near the center caramelize and the ones on the edges blacken and turn crispy. 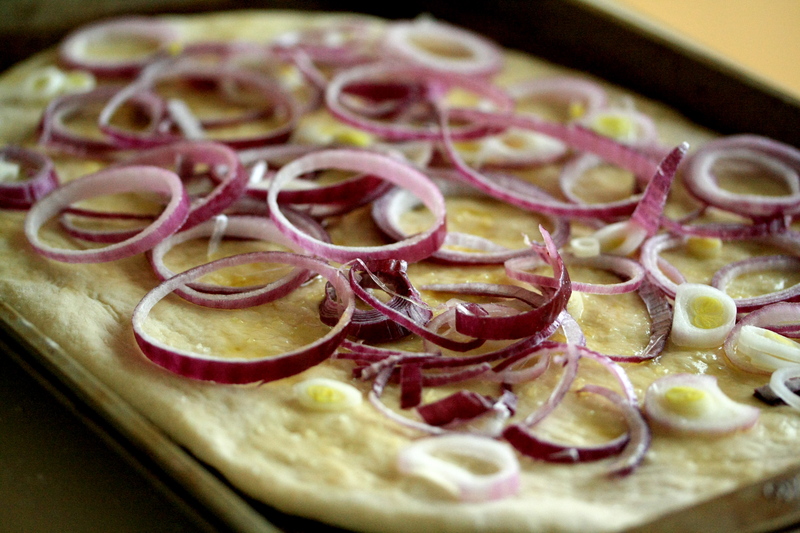 If you don’t like onions, you can of course put something else on there, or leave it plain. Make the dough by dissolving the yeast in the water, then adding it to the flour with 2 tablespoons of oil and a hefty pinch of salt. Knead to make the dough come together, adding more water if necessary until you get a uniform ball. You want it to be soft but not sticky. Grease a bowl with some olive oil and set the dough ball in the bowl to rise. Cut an X into the top of the dough before covering the bowl with plastic wrap or a damp towel and allowing it to rise undisturbed for 1 or 2 hours, until it has at least doubled in size. When the dough has doubled in size, grease a baking pan generously with olive oil and roll it or press it to a thickness of about 1 cm. Make dimples in the dough using your fingers, and drizzle some more oil on top of the dough. Chop the onion into thin rounds and scatter them across the top. 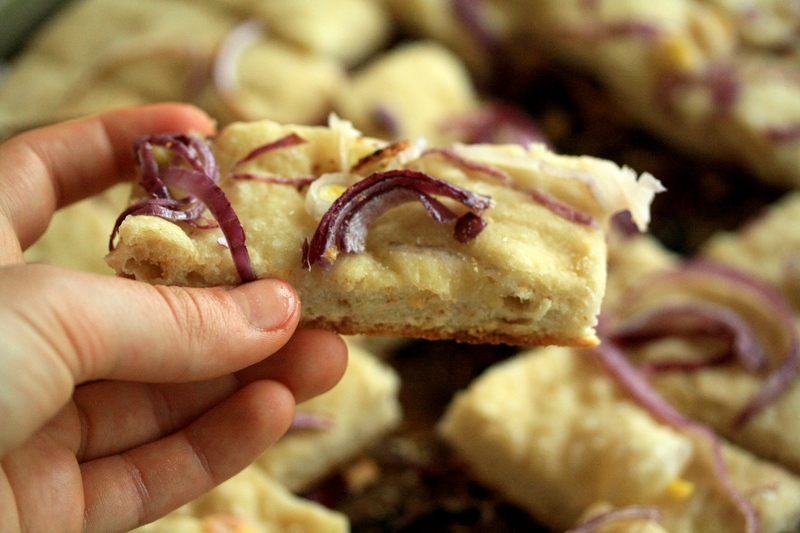 Sprinkle another hefty pinch of salt across the dough and let the focaccia rest for another 30 minutes. Preheat the oven to 450 degrees and bake for 15-20 minutes. Enjoy!